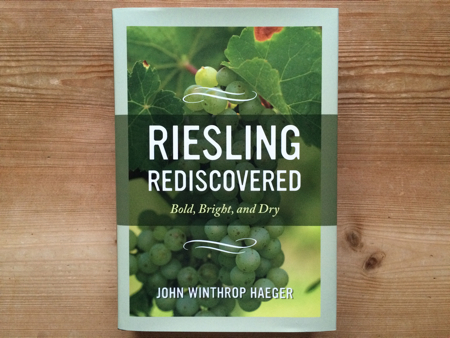 When I first heard that John Winthrop Haeger was writing a book dedicated to dry Riesling, I was very excited. Over the past few decades, dry Riesling has really taken off—more great dry Rieslings are being made today than ever before, not only in Germany, but also in Austria, Italy, the United States, and Canada. In Riesling Rediscovered: Bold, Bright, and Dry (University of California Press, 2016), Haeger attempts to provide a fresh, up-to-the-minute look at this fast-growing phenomenon—not only in Germany, but throughout Europe and North America. For the most part, he succeeds in his goal. Despite some oversights in the content (where’s Australia? ), Riesling Rediscovered fills a significant void in contemporary oenological scholarship with its detailed look at the expanding quality and popularity of dry Riesling, the increasing diversity in styles, and the land and people behind these exciting wines. The first half of the Riesling Rediscovered is a comprehensive survey of Riesling, covering the history, biology, and culture surrounding this truly exceptional grape. I was particularly impressed by the scope and detail of the historical content, which went well beyond that of most other books about Riesling that I have read. Here, Haeger successfully presents a narrative of the historical development of dry Riesling, from the Middle Ages to the present, with many facts that are likely to surprise even the most well-read Riesling fanatics. For example, I was completely unaware that the same Savagnin Blanc responsible for vin jaune was one of Riesling’s primary competitors for Mosel supremacy before the 19th century. Riesling Rediscovered provides one of the most detailed analyses yet of the Trockenwelle ("dry wave"), or the dramatic increase in the production of dry Rieslings over the past few decades. Haeger successfully links together the factors that drove this “dry wave,” especially the growing perception that sweeter wine meant lower-quality wine; the increased popularity of French-inspired cuisine in Germany; German consumers gaining greater exposure to dry Rieslings from Alsace; the Austrian diethylene glycol scandal; the Charta movement, led by the late Bernhard Breuer of Georg Breuer in Rüdesheim (Rheingau); and last, but not least, climate change. In the second half of the book, Haeger profiles many of the top sites in the world for dry Riesling, along with the producers making the wines from these vineyards. For each vineyard and corresponding winery, he examines the soil, microclimate, and viticulture, along with the history of each site, and the people behind the wines. Rather than attempting to highlight all the top winemakers and terroirs for dry Riesling, Haeger spotlights ones that he thinks denote “a good picture of the present state of the art” throughout the Northern Hemisphere. The result is a panoramic look at the entire spectrum of Riesling, from established classics, like Clos Ste. Hune, to good-value brands, like Charles Smith’s Kung Fu Girl. This also means that some superlative producers, such as Keller and Schäfer-Fröhlich, are left out entirely. The tasting notes with the profiles are relatively brief, and primarily for vintages from the past decade. Of course, many of the New World producers in this book have only been around for short periods of time. Don’t expect to find many notes on dry-tasting feinherb Rieslings or sparkling wines, however. In my opinion, both of these steadily growing categories deserved more attention within these pages. One criticism with this section is that it only includes a single profile for one producer in the entire Mosel region (including the Ruwer and Saar), that being Clemens Busch. Busch is undoubtedly a talented winegrower, and I was quite impressed by his 2012 Pündericher Marienburg GG when I tasted it earlier this year. Nonetheless, I would like to have read similar profiles for more Mosel winemakers, especially when Haeger mentions that the likes of Eva Clüsserath (Ansgar Clüsserath), Ernie Loosen (Dr. Loosen), Sybille Kuntz, Thomas Haag (Schloss Lieser), and Gernot Kollmann (Immich-Batterieberg) have all made exciting dry Rieslings. Similarly, I was surprised that no growers from either the Saar or the Ruwer are noted whatsoever. I have certainly had my share of compelling dry Rieslings from the likes of Maximin Grünhaus, Karthäuserhof, and von Othegraven. Fortunately, this book includes several producer profiles for each of the other major Riesling-growing regions of Germany (the Pfalz, Nahe, Rheingau, and Rheinhessen). Aside from a couple of surprising omissions (Keller and Schäfer-Fröhlich are nowhere to be found), Haeger manages to include most of the major players along with some lesser-known names. Outside of Germany, virtually all of the leading producers of dry Riesling in Alsace, Austria, Italy, and North America are in the book. I definitely enjoyed learning about the Rieslings coming from emerging regions, like Michigan’s Old Mission Peninsula and the Similkameen Valley of British Columbia. The Southern Hemisphere is completely excluded from this book, which is unfortunate for those of us who have enjoyed Grosset’s Polish Hill Riesling or any of the growing number of dynamic dry Rieslings coming out of Australia, New Zealand, and South Africa. Dust jacket of Riesling Rediscovered: Bold, Bright, and Dry. Andrew Bair is a nonprofit development professional and German wine aficionado who lives in the Boston area. His most memorable dry Rieslings have been Keller’s 2013 Abtserde GG and 2003 Kirchspiel GG and Schloss Schönborn’s 2010 Marcobrunn GG. Thank you so much for the kind words. I’ll definitely look forward to reading anything else you write in the future! I’m only on chapter four, but I’ve been impressed by John’s well-researched book so far. Now, I’m reading Part II on sites and producers. My focus is on the Rhine Basin. I really like John’s well-written and detailed profiles. You can tell that he did his homework. As Andrew said, his book’s most important omissions include Keller and Schäfer-Fröhlich. I would add Wagner-Stempel, von Winning, Dönnhoff, Eva Fricke, J.B. Becker, and A.J. Adam to the list. I, personally, like to drink dry German Rieslings that are lighter in body and higher in acidity.